Several NJIPMS members made it to the JerseyFestFair figure and sci-fi show last year and had a blast. It’s back again this year, the weekend before the Nationals. Link added to the Upcoming Events page. Due to the second Friday regular meeting date conflicting with the Nationals in Hampton, VA, we will NOT BE MEETING during August. For those coming to the convention, we’ll see you there. For everyone else, we’re on track for a regular meeting on September 12th, at the Knights of Columbus in Garwood. 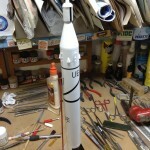 Check out the tale of Mike Terre’s battle with the 1/48th scale Jupiter “C” rocket, a reissue of an old kit by Glencoe, and have a chuckle or two reading. Added to the Reviews section HERE.